Shipping containers have never looked so sparkling. 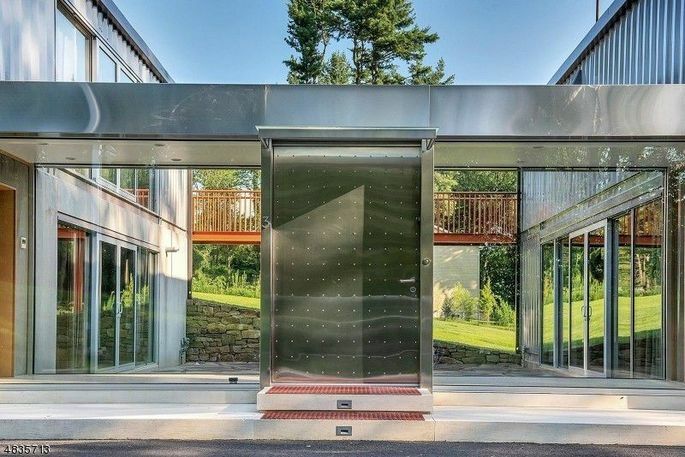 In fact, passers-by might not realize this modern marvela four-bedroom, 4,000-square-foot glass home in New Jersey recently listed for $875,000was built from something so ordinary. Architect Adam Kalkin found inspiration for the home in an unusual place: the ports of New Jersey. In his daily commute to New York City, he passed by piles of shipping containers. "He thought, 'How can I upcycle them into a living space?'" says listing agent Caroline Gosselin. 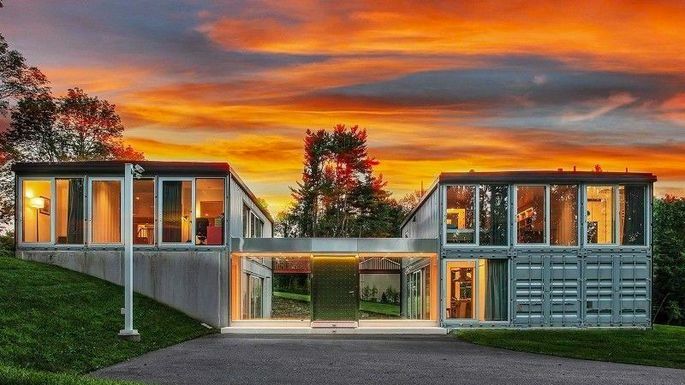 Kalkin is not the first architect to follow this line of thinking: Shipping container homes have enjoyed a surge in popularity. Kalkin considers metal containers "zombies." He even started a firm called Industrial Zombie, which "re-imagin[es] them for a higher purpose, thereby giving them new life." 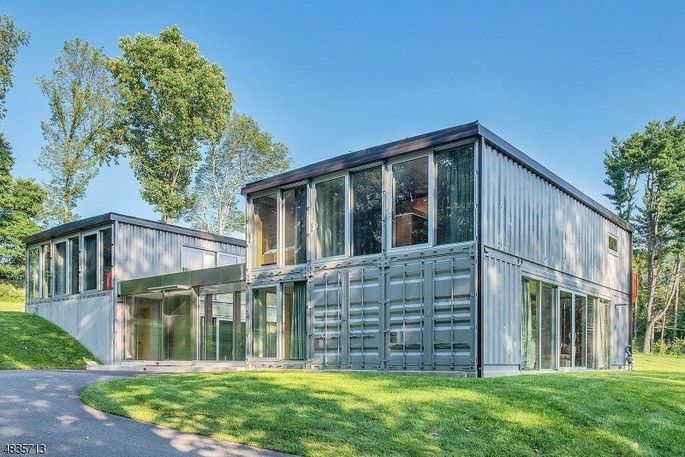 So he breathed life into his own shipping container masterpiece in 2008: two side-by-side structures on a hillside in Tewksbury Township. Hints of the home's origins can be seen in the corrugated metal siding throughout, and the wooden beams that mark the joining of the containers. 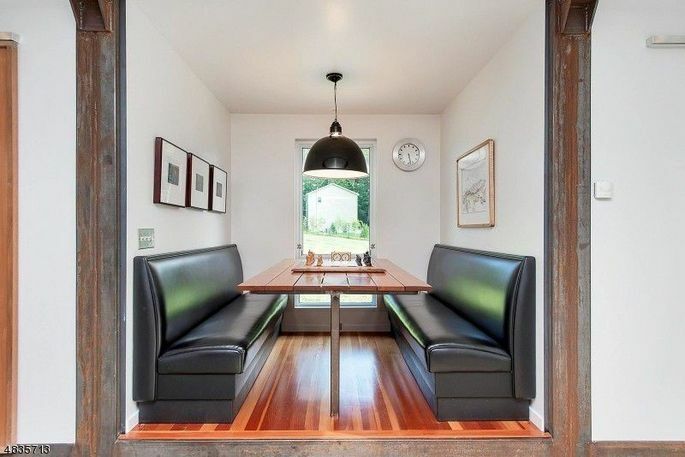 Off the dining room, the cozy space that holds a table and leather booths is the size of a shipping container. Potential buyers are "surprised by how much space it is," Gosselin says. "It takes shipping containers to a whole new level." A mix of concrete and upcycled hardwood floors give the home a hint of industrial chic, and floor-to-ceiling windows could make you forget the home's humble origins. But it's the home's second owner who built the space's "showstopper," says Gosselin. Kalkin originally designed two separate buildings. The current seller invested $300,000 in a steel and glass breezeway joining the two structures, making "it a whole home," she says. Each level offers 1,000 square feet of spaceplenty of room for a library, yoga room, and spa. Want to keep overnight guests close, but not too close? Give them free rein of one half of the building. The breezeway keeps you connected without feeling like you're stepping on others' toes. City mice who want to burrow in the country will find this property particularly appealing. The train to New York City takes about an hour, and Califon, the surrounding town, feels very much like "horse country," Gosselin says. "It gives the best of both worlds," she says. "It's great for someone who wants to be in nature but doesn't want to give up that loft-like, industrial-modern feel," the agent adds. 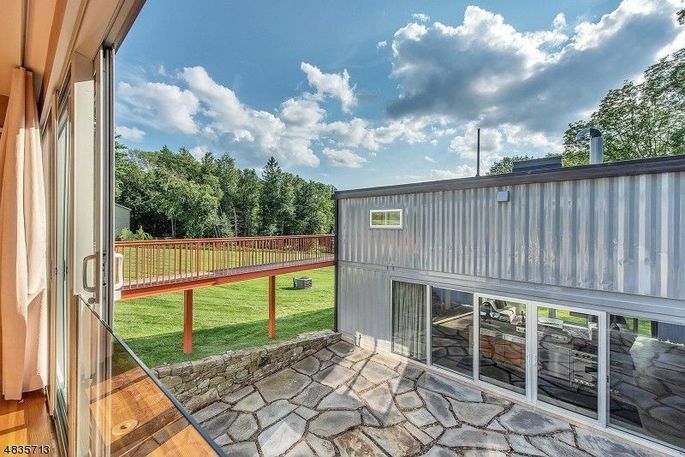 Posted in Uncategorized | 0 Responses to "Modern Shipping Container Marvel in New Jersey on the Market for $875K"